It is one of the hottest days of the year. Central London is a white glare of stone and concrete. Warm humid bodies jostle on the pavement. The shimmering steel and exhaust of traffic heats up the stew. Then we turn off The Strand into the stillness of Somerset House. The splash of water is the only real sound we hear. It cools us with its relaxed and easy rhythm. 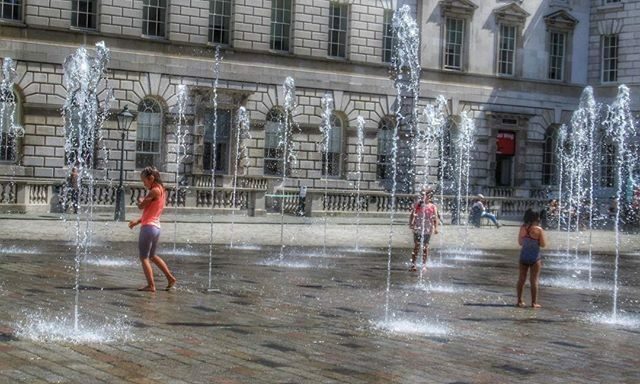 Children are dancing in the streams of prancing fountains, drenched in their clothes, laughing and fresh in the heat. We adults watch them from the sidelines. Some of us are standing close to the edge of the liquid artwork. Some are seated at cafe tables. A few wander on the sharp white paving with our cameras, snapping shots. We are too sensible to skip into the fountains. Our clothes would get wet. Our phones and gadgetry would be ruined. We would look silly. What adult dances and giggles joyfully at something so simple as sprays of water? So we stay sensible adults by the sidelines, all dry and proper in our city clothes and let the children be wild for a moment longer. We allow them a chance still to express their natural wonder and delight before it is time to step back into the world of stone and growing up.